Burgeoning Wolverine Star: Is there less competition for pro-style QB recruits? Is there less competition for pro-style QB recruits? Thinking about a pro-style offense that employs slots and would fit fairly well.... What about the Patriots offense? Slot guys, undersized receivers and running backs....Obviously Tom never runs, but they could incorporate the single-wing QB runs and ISQD's pretty easily as well as roll-out run-pass option plays....Am I dreaming here? Is there any way with the Michigan connections over there that Borges/Hoke could go in this offseason pick Belichick and Brady's brains and/or outright steal some of that offense all together? What about the Eagles offense? It seems this would be a pretty good recruiting pitch - "You know Tom Brady? The Patriots? That team that crushes people all the time? Yeah - we're running their offense." The Patriots may be pros but they don't really run a pro-style offense anymore thanks to Brady. Unfortunately for Michigan's immediate future, the things that make Brady one of the greatest QBs of all time—pinpoint accuracy and I'm-from-the-future coverage reads—are the things Robinson has in shortest supply. Long term I'm down with what seems to be Borges's preference for a pass-slanted West Coast offense, which is a system that works and works well when you've got the right guy at the helm. One positive about returning to something resembling the old offense is that college football's tilt towards spread systems has made pocket guys more available, and Michigan's reputation was enough to lure Ryan Mallett north despite that not being the best idea in the world for him personally. This is a logical conclusion to draw but I wasn't exactly sure that it was a realistic one. The following is a rundown of all 3-star or higher pro-style QB recruits* and the number of schools that accepted commitments from at least one. I used Rivals' recruit search function to collect the data as far back as they had it (2002). For comparison, I added in the number of dual-threat QB recruits as well as the schools that accepted commitments from at least one of those players. The number of recruits has increased significantly over the years. This is a logical progression as recruiting becomes more and more of a mainstream process, but the number of recruits in 2002 and the numbers we've seen in the last few years (especially for pro-style QBs) are pretty staggering. First a caveat about 2011: The reason there's a significant drop in the percentage of schools with commitments from pro-style QBs is because signing day hasn't passed yet. As you can see in the chart above, there are still 12 uncommitted pro-style QB recruits in 2011. While not all of them will end up committing to an FBS program, it's safe to say that at very least, four or five will, significantly increasing the percentage here. 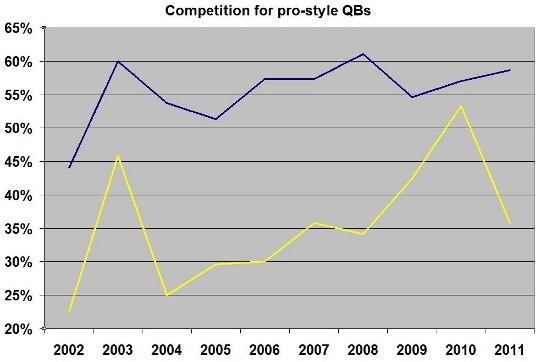 A few assumptions: If we presume that competition for pro-style QBs has indeed decreased as the spread offense became more prevalent, the above graph should show the percentage of pro-style QBs (blue line) either increasing or staying constant while the percentage of schools that receive a commitment from one (yellow line) to decrease. The opposite should also be true. Two lines increasing or decreasing at the same level should indicate a constant demand for pro-style QBs. Also, over time, you would expect some minor, if noticeable, ebb and flow to the percentage of teams that receive a commitment from pro-style recruits (not unlike a sine wave) as schools don't need them every year. Unfortunately, I don't have enough data to display the trend. What we see here is actually what appears to be an increase in demand and competition for pro-style QBs. After a quick eye test, it looks like the number of schools receiving commitments from at least one pro-style recruit is increasing at a slightly higher rate than the percentage of pro-style recruits. If nothing else, we can likely conclude that the demand for pro-style quarterbacks has not decreased since 2002, even with the increasing prevalence of the spread offense. This doesn't really mean anything for Michigan, which is a program that, regardless of the recruiting competition, has been able to lure stud recruits when they want them. This was more of a fact-finding mission. Let me know if there was anything wrong with my logic/process here, as there very well might have been. *I set the lower limit of the sample size as 3-star recruits because those are the lowest ranked recruits we reasonably expect Michigan to actively recruit and not just take a flier on. Chris - I appreciate the analytical bent, but I think the devil here is in the details. The real question isn't the *total* number of school taking commits from pro-style QB, but *which* schools. The possibility exists that more and more top-level BCS conference schools are switching to spread offenses and that competition for the best pro-style QBs **among those schools** has decreased. Of course most of the FBS-quality pro-style QBs will find homes somewhere or another - as your charts show - but what may be happening is that some of them end up settling for lower-rated programs, which wouldn't be evident in these charts. So Brian's supposition may be correct, in that there may be less competition among top-tier BCS schools for top-tier pro-style QBs. Good thought. When I was initially pulling data, I was writing down recruits, their rankings, and the schools they attended. A quick spot check showed that most of the highly ranked players were still attending the big-time schools, but a more thorough fisking may be in order. I'll try and get something up later today or tomorrow. Also, the graph posted above may not be entirely helpful. I think it is, but I did it late last night when my mind was giving out on me, and I'm having second doubts about it now. I have another graph that shows a more direct correlation between the amount of prospects and the amount of schools receiving commitments. I'll try and get something up later today to fill out the study a little better. Brian says “more pocket guys are available”. Using rivals rankings as evidence, you yourself note “The number of recruits has increased significantly” and your data shows this is true for pro-style QBs. You could probably just stop there and say he is right. It is an interesting discussion - do QBs run more now than they did 5 or 10 years ago? Its seems so, but wheres the evidence? You seem to be arguing …well, I’m not sure what you’re arguing happened to the QB supply and demand. The section with the chart is so badly organized and communicated that its borderline incoherent. You attribute the increase in listed/ranked 3-star+ QBs to: recruiting becoming a “mainstream process.” I have no idea what that means. To me, it seems that Rivals is just handing out 3 stars to more people and/or just increasing the size of their database. Regardless of why, your assumption is that somehow, supply of QBs has gone up. This is logically dubious. Did parents start producing more QBs? Did the number of QBs per school increase? Did the number of schools increase. The answer to each is no. The problem with your approach here is that you take rivals rankings and classifications as representative of the total population of potential recruits, even though the data says its probably not (the US had no demographic or social changes that would increase production of QBs). Rivals can increase its number of 3 star recruits all it wants and it has no impact on supply or demand of college QBs. You take Rivals rankings to mean more supply (even though there is no logical explanation for this.) You then take the increase in supply and assume an increase in demand (even though things don’t generally work this way – I suspect you didn’t major in Econ). I think a better metric would be to look at all the ATHs and figure out what percent of them became QBs…but even that approach would be flawed. You could probably just look at carries by QBs and see that QBs run a lot more. I also don’t see why demand would ebb and flow from year to year. This is a poor analysis and utterly unconvincing. You can do(and have done) much better.